Scratching your head trying to build a website? Not sure which platform to go to, which server to host from? Or better yet, not sure what the technical mumbo jumbo of designing, developing and building a website means? Then stop! You are here, and we will help you find the right option to build a website for your business. It’s a known fact that the world spends most of its time glued to the internet, which in turn also means that if your business is not ‘online’, you are losing out on a huge customer base. Since you are here, we know that you are already aware of this fact and want to know about the best options that will help you build a website and take your business to another level. How much time are you willing to give to your website? The above 5 questions are synonymous with 5 parameters: Cost, Technical Requirements, Functionality, Maintenance and Scalability, and answering these questions honestly will help you narrow down on the best options through which you can build a website for your business. DIFM: Because sometimes, coding is necessary! TemplateToaster Software along with the technical team! So, What’s the Best Option to Build a Website for you? Website Building Options – how many were they again? Honestly, there are several. However, we have narrowed them down for you to three options that serve as umbrella categories for several others. DIY (Do-It-Yourself) – You find a platform, within minutes your website is ready. DIFM (Do-It-For-Me) – Someone finds you a platform, take detail requirements and creates a website for you. Hybrid (a blend of DIY and DIFM) – Narrow down on an option and then hire someone to customise your website for you! As basic as we have made that sound, it isn’t. The three options are hubs for you to find the best platform that will work to establish your online presence. If you have answered all the questions we mentioned above, you probably have an idea about how much you are willing to spend, how much time are you willing to give to your online business, and if or not you want to indulge in it for the long run. These answers will help you decide which platform works for you when you are looking for the right option to build a website, as we are about to give you an in-depth knowledge about the available DIY, DIFM and Hybrid options. DIY – For the one man army! Earlier you needed to be a coder, know things like HTML and CSS, along with the mumbo jumbo called hosting, if you wanted to build a website. Or you needed to pay someone thousands of dollars to do all those things for you. Today, however, you need to know none of the above to build a website that not just looks professional but can be set up in a matter of minutes. We are talking about DIY Website Builders, which give you an easy way to build a website without learning a single code! A DIY Website Builder is essentially a software available online by which you can start building your website using the available templates/themes or by inserting content, pictures, and videos on a blank canvas to create a unique professional looking website. There are several DIY Website Creators available online, most of which are free and offer optional subscriptions according to the users’ needs. We have compiled a list of the best DIY Website Creators available today or in other words best theme builder software, along with the parameters that make them unique! Wix is a cloud-based platform on which you can build a website with an easy drag and drop feature on a blank canvas. Cost: Ranges from free to about $14 – 30$ a month subscription plans. Technical Requirements: Almost Nil, you just need to know how to drag and drop components on a pre-designed theme or blank canvas, unless you want to make your website responsive, as many templates do not offer such compatibility. Functionality: With more than 500+ professionally designed themes to choose from, the software offers designs that cater to a multitude of industries like e-commerce shops, information blogs, and other such websites. It also comes with an inbuilt AI (Artificial Intelligence) which learns about you and uses this knowledge to build a unique website. Maintenance: Wix takes care of the hosting services and offers all the technical requirements but you still need to maintain your website with regular updates. The AI offers help in a manner that it learns to update your website. However, if you wish to change the template, you will have to start from scratch, all over again. Scalability: With Wix, you can only design one website per subscription so if you plan to expand, you have to pay more. It also doesn’t offer third-party CMS support and you cannot access your work offline if the need arises, as WIX is a cloud-based platform. Like Wix, Weebly is also a cloud-based website building platform, which allows users to drag-and-drop features but onto predetermined areas of a blank page. Cost: Free – $25 a month for a business plan, when paid annually. It also offers an ‘App Store’ from where you can buy features that you wish to add website – this, however, adds on to the cost. Technical Requirements: Weebly sites are completely responsive and therefore you do not require any coding skills. Nonetheless, there are themes that are not responsive, so you may either have to do without them or learn to code a little. Functionality: The tagline of Weebly is – ‘Create a Free Website, Store or Blog’ and true to its words, it offers all three. You can choose from various pre-designed themes, and use the interactive and easy to learn software to build websites that look professional and are unique. And unlike Wix, you can change your template as many times as you like, without having to start from scratch. Maintenance: Due to its myriad of features, it easy to maintain the website. However, you need to update the content by yourself to keep your website fresh and popular. The technical requirements, like security, hosting, and website building is taken care of by the platform so you can sleep easily without having to worry. Scalability: With the help of the Weebly ‘App Store’, you can add as many features as you like to your website, you can also change your template if the old template stops serving your purpose. This gives you the flexibility that any business would require if it plans to expand. However, like Wix, you can only design one website per subscription, and Weebly doesn’t offer third-party CMS support. TemplateToaster is a desktop DIY Website Builder software and WordPress website builder which works well with almost all major Content Management Systems like WordPress, Joomla, Magento etc. Cost: Free Trial – Standard Edition available for $49 and Professional Edition for $149. Technical Requirements: Other than a desktop – none! All you have to do is download the software on your desktop and you’re good to go. Unlike other platforms, TemplateToaster is available offline so you can work to build your website without the worry of having an internet connection. Functionality: You can choose from more than 200+ professionally designed themes, or you can customise themes according to your needs by changing the code, or you can build the theme of your website from scratch. Maintenance: Template Toaster offers all the technical requirements needed to build a website. It also offers a multitude of plugins and widgets that you can add to your theme as per your requirement. Scalability: You can work on your website even when offline, you can build n number of websites with only a one-time payment and you can also get the support of any CMS you like. You can also change the mobile view of the website you design as per your liking. Squarespace is easy to use DIY Website Builder, with more than 50+ professionally designed templates from across various industries to choose from. Cost: Free 14 day trial, after which a business plan starts from $24 a month, however, if the price goes up if you require more features for your website. Technical Requirements: You do not need to code, at all. All the templates designed are responsive and hence require no technical skills. The interface of the platform is fairly simple to use, and there is 24*7 customer support if you require any help. Functionality: With so many templates to choose from, you can build a website easily by just following a few simple steps. The templates are responsive and you can build an e-commerce shop, a picture gallery, a blog or any other template without having to worry much. Maintenance: The templates offered by Squarespace are hosted online by the platform itself. The platform also offers plugins. The only maintenance required is for you to regularly update your website so as to get more visitors. Scalability: Squarespace, does not offer portability, which means that if in future you wish to move your work to another platform, you cannot do so. Although you can edit the CSS code of your website if you have the technical skills, you cannot edit the mobile view, which means your website will appear on the mobile as it appears on a desktop. Looking out to choose between above three? Find here an in-depth analysis on Wix vs Weebly vs TemplateToaster and Squarespace vs TemplateToaster. You may have heard or you may have worked with WordPress – a leading Content Management System which allows you to build a website using an almost unlimited number of changeable themes. One of the latest developments in the world of WordPress has been – WordPress Theme Frameworks – which come with inbuilt codes and functions such that designers and beginners alike and design stunning themes almost instantaneously. Cost: Basic Plan starts from $55. Technical Requirements: No coding required, easy drag-and-drop functions on a blank canvas. Functionality and Maintenance: You can build a customizable theme for WordPress, which you can then host the WordPress server in about a few minutes. The good thing about using a framework is that you get to design your theme but have the support – security, and maintenance – of one of the largest CMSes available. Scalability: The Website designed using this framework is scalable, and it can be re-designed for mobile and is highly dynamic. Owing to its platform, it can also be moved to another hosting server when required. Cost: Basic Plan starts from $59.5. Technical Requirements: No coding required, you can start working on a pre-designed theme or tweak a theme to suit your needs. Functionality and Maintenance: The Website you build with this framework is mobile responsive, comes with featured content widgets, customizable templates and is easy to change and edit as per your requirements. 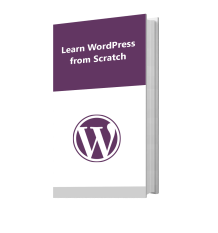 Scalability: Since the framework is designed for WordPress, your website will be scalable as it will be hosted on WordPress, one of the largest CMSes available. If you would like to have more on them, check out the complete comparison of various WordPress Theme Frameworks in detail here. DIY is all well and good as it gives you a framework, all you have to do is add on the thing you’d like that framework to display. It hardly costs anything, and you get an online presence instantly, such that you can share your work everywhere. However, if you run an e-commerce website, a newsletter, or are looking to create a very strong online presence, then DIY is not for you. Read on and find out the right option to build a website for your industry. There’s a reason coders haven’t gone out of business, they are sort of required. DIY are all well and good but you don’t need to be a coder to crack this code: if you want to build a website which is not just scalable but unique and highly professional, you need the skills of a professional and hiring professional costs money! That is where “Do It For Me” web design and development comes into practice! On the scale of parameters, ‘Cost’ takes away the winning price. In order to go professional, you need money. And if you don’t have a long-term plan at hand, you need to go back to reading about DIY, because if you do it wrong, you lose money – a lot of money! That said, there are two ways to go about DIFM websites. 1. Start From Scratch – A website built completely on code – which is changeable as per your liking. The website built from scratch is extremely flexible as it is created using Ruby on Rails and CakePHP. 2. Custom Website Built on Open Source CMS – As mentioned above, a website built for CMSes like WordPress and Drupal. The first option gives you more flexibility, but the second option allows you to not be dependent on one framework and you can take your work to another development company if the former stops serving your purpose. More on this later. Agencies are there because they know what they are talking about. They are professionals who will take care of all your needs, without you having to move a finger. Cost: Expensive, hiring an agency means hiring several professionals who take care of your website like a team. You will have a team of designers, developers, marketers looking after the workings of your website, and this costs money. Technical Requirements: None at all. You don’t have to do anything. The agency will also update your website regularly if you ask them to. Functionality: Along with being functional, working with an agency will give you a website which is extremely flexible. If you decide to build your website from scratch, the agency will incorporate all your requirements, in the code. They will take care of the security, hosting and running a website that is customised according to your requirements. Maintenance: If you choose to get your website designed on an open source CMS like WordPress, you can easily update the content by yourself, removing the need for the agency once your website is up and about. However, if you go with option one, which is building your website from scratch, you will require your agency to regularly update your website for you. Scalability: Websites built from scratch or on an open source CMS are extremely scalable. The drawbacks, however, is any are that the agency may shut down and if you do not know a lot about what was going on with your website, you may not know where to go next. Or you may be roped in with an agency that charges you more than they deliver. Depending on the skill set of a freelance developer/designer, you can get a professional looking website designed, at less than half the cost of what an agency may charge you! Cost: As expensive as the skills of a freelancer. If you hire a freelancer who has more experience in the field of website development – you pay more. If you hire someone who is fresh in the field, but good with what he/she does, you get a lot of work done, without paying a lot of money. Technical Requirements: None at all. You have to hire a freelancer on word-of-mouth or by visiting some of the best freelance websites like Freelancer, Upwork or Truelance, which allow you to choose from a range of freelancers available. Functionality: A good freelancer, can build a website as per your requirements. The website he/she builds can be developed from scratch or on an open source CMS, all of which is decided by you. Hiring a freelancer gives you more freedom with your work than an agency since no one can question what you may or may not want to do with your website. Maintenance: You can hire a freelancer any time you wish to update your website, or you can work on your website by yourself – if that is you know coding, or if your website is hosted on an open source CMS. Scalability: As mentioned above, websites built from scratch or on an open source CMS are extremely scalable. There are hardly any drawbacks with hiring a freelancer other than his skill set not being at par with your requirements. So choose with caution! Two ways to go about creating DIFM websites – in-depth! As mentioned earlier, there are two ways to build a website when hiring an agency or freelancer. You can either get it built from scratch or you can have a custom website built on an open source CMS. The section below shows how you can have a website hosted on an e-commerce platform, and how you can have a website created on an open source platform with the help of an agency or a freelancer. This section focuses more on e-commerce websites because they require a lot of customization that doesn’t quite work with DIY website builder platforms. Shopify is an online commerce platform and is also one of the most popular among this category. Cost: Basic plan starts from $14, and Unlimited costs $179. Technical Requirements: The back-end UX is slightly difficult to understand, and will require the help of a freelancer or agency if you are not very tech savvy. Functionality: Websites built through Shopify focus mainly on e-commerce, so it is obviously not a platform for someone not looking to sell things. Nonetheless, the websites are highly customizable, but if you are not tech savvy, you will require the help of someone. Maintenance: E-commerce websites usually require a lot of work, because of their massive inventory and payment getaways. The website needs to be checked regularly and for that, you need to either learn how to work on your website yourself or hire someone to do it for you. Scalability: Since it is the best in this category, it is safe to say that a lot of people like and use it. The websites built on it are highly scalable and should not be a problem if your website has some heavy content on it. The world’s top 100,000 e-commerce websites have been built on Magento’s platform and therefore it is by far the most popular CMS for e-commerce websites. Cost: Varies, after you buy a plan, you may need to hire someone to build your website as Magneto’s platform is a bit complex. Technical Requirements: Requires sufficient technical knowledge, and is better for large business who can hire an agency or a good freelancer. Functionality: Highly functional as it can be customised completely to suit your purpose. It has a large number of marketplace extensions, along with a highly active customer support team that is always available if you require any help. Maintenance: As mentioned earlier, e-commerce websites require a lot of work. You can’t sell without being vigilant about your products inventory. It may take time and money, but building on Magento helps you build a website which is robust, beautiful and highly professional. However, the back-end is complex, and you would require help when venturing into Magneto’s CMS. Scalability: The websites built on this CMS are highly scalable, and you will not require moving to another platform. However, if you do wish to move, you can. A WordPress plugin designed for building e-commerce websites on a WordPress Platform. Cost: Very low, depends on your WordPress plan. Technical Requirements: No coding required, very easy to understand. Functionality: Since it runs on WordPress, and WordPress being one of the best platforms when it comes to ease of use, this plugin can work wonders for your e-commerce website as it will not cost a lot. You can add a lot of inexpensive add-ons, and create a functional website in no time. However, for heavy customization, you may require help from a freelancer. Maintenance: Other than regularly updating your inventory, you will not have to worry much about the security, as all websites built on WordPress are protected by its server. However, if you are working with a pre-designed theme, you may want to get its code checked for any security issues. This may require you to hire someone who knows their way around coding. Scalability: As scalable as any other WordPress website. If you are a small business, this would work well for you. However, if you are looking to expand or already own a large business, this platform may not work for you. Say you have a lot of money and are looking for a breakthrough in the world of the internet, then DIFM is for you. You can easily hire a good agency and they will do all the work for you. However, if you do not have a lot of money, you can either go with a DIY option or you could hire a freelancer. That said, go with DIFM only after you have a long-term business plan in hand, or you may lose more money than you might make. A little bit of this, a little bit of that and voila: a professionally built website! It is easy to build a website by inculcating a few factors, without much hassle. Read on to find out two ways in which you can have a good website built without paying a ton of money! 1. TemplateToaster Software along with the technical team! Buy TemplateToaster Software, design your own theme and if you get stuck in a rut, that is you want a heavier and far more customised design for your website, you can get paid support anytime! Cost: Price varies. Once you have made the one-time payment for the software to build your website, you are good to go. However, if you wish to add customization and require paid support, then you can receive it by paying a little money. This fees varies and depends on the amount of work you require from the support team. Technical Skills: No coding required! You can easily design your own theme or you can choose from the various available themes and customise them as per your requirements. Functionality: Once you download the software, you can work on a theme all by yourself. However, if you require a website that looks professional, and is scalable without spending a ton of money, then you can take help of TemplateToaster’s paid customer support team. The team, comprising of website developers, designers, and marketers, will help you build a remarkable website without you losing out on a lot of money. Once the website has been built, you can update it regularly through any of the CMSes or take the help of the support team, it’s as simple as it sounds! Maintenance: The website built using TemplateToaster can easily be maintained as it offers compatibility with all leading CMSes. This will allow you to update content, without the hassle of running back and forth to an agency. Another great thing is that you can work on this software offline to design the theme of your liking. Scalability: Since TemplateToaster is compatible with all leading CMSes, the scalability of your website knows no bounds. With the help of the support staff, you can easily create a website, host it, and recreate it, as many times as you want! You can also create more than one website, once you buy a subscription! 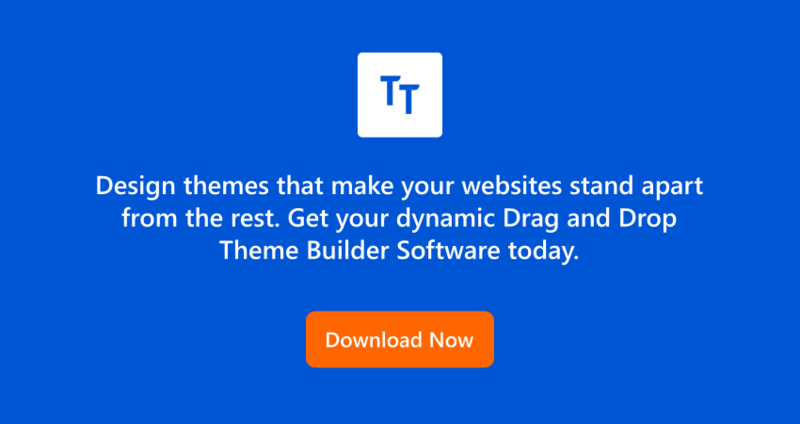 You can easily buy a theme from websites like ThemeForest or TemplateMonster or TemplateToaster Marketplace and get a pre-designed professional looking theme for your website! Cost: Varies, some themes are free, some themes you can buy and some you can exclusively own – which means that once you buy a theme, you can stop other people from buying the same theme, giving you exclusive ownership. Technical Skills: No coding required! However, you may require to code some features if they are unavailable. Functionality: Once you buy a theme, you can customise it according to your business. This gives you the freedom to choose from n number of themes that suit your purpose and to change themes according to what you truly want. Maintenance: Varies with themes. Some themes are fully compatible with all the features already present. Some, however, lack responsiveness or do not work as you would want them to work. Themes also come with inbuilt code by a designer, which may be of hassle if you require more security of flexibility, for which you may require a coder! Scalability: Themes on a general level are scalable. However, scalability like maintenance is highly changeable with themes. Some themes as mentioned above are perfect, some, however, require coding. The support staff of these platforms does come in handy in such times, or you can always hire a freelancer or agency to do a bit of tweaking required! So you’re read about DIY, and also about DIFM, but you feel that each option separately is just not right for you. You probably have worked with a CMS before, find it hard or easy, but do believe that a professional handling your website will be the better way to go about it. Then you are at the correct place. Hybrid gives you the best of both worlds, without burning a hole in your pocket. Although it isn’t as inexpensive as DIY, or doesn’t give you exclusive help like an agency would, but at the end of the day, it gives you a professional looking website which is functional and scalable – what more could anyone want? 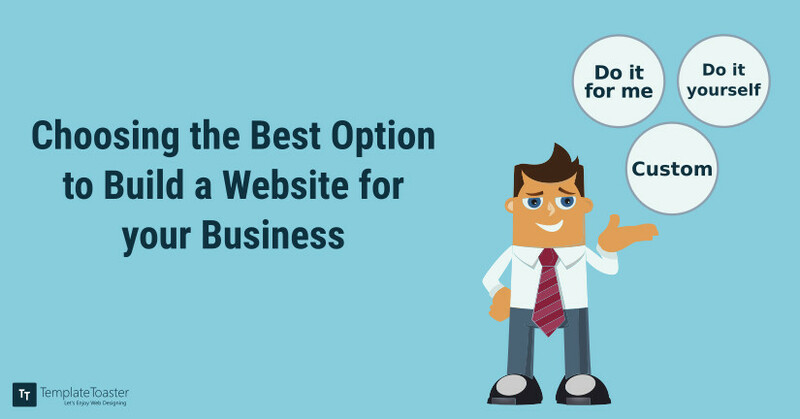 So, What is the best option to build a website for your business? If you have read about all the available options in the market, you may be more confused now, that you were at the beginning! If you have a small business, and all you want is to have a website that showcases your work, your best option is to go with any one of the DIY options. This is also good advice for beginners, since you may not know how the world of websites works. It is a little investment, but greater results. If you wish to expand or if you wish to update your website regularly with inventory or information, you should look for a DIY that lets you take your work to a bigger platform e.g. a CMS. However, if you are a small business and wish to take your shop online, your best bet is to go with a DIFM option. This, however, may cost you! The best way to go about it is to hire a freelancer as they cost less, and get a custom website designed for an open source CMS. This way, you can have an online presence, which is scalable, along with the flexibility to take your work ahead by working on a CMS on your own, or taking your website to an agency for expansion! If you are a large business, looking for an online presence, you have a lot of options available! You can either go at it on your own with a DIY option, or you can keep your options open by working with a Hybrid, such that you have a website that can easily hold the content that is sure to come in if you have a business that requires you to update information or an inventory regularly! However, if you are a large business, looking for an expansion of an online presence – go with an agency! They charge more, but you will get what you need without any technical or professional hassle! You can easily tell an agency your requirements and they will get on it! However, do keep in mind that you are not looped in an agency that does not seem to have a promising future or is vague about offering you services after they build you a website! You can also hire a professional freelancer, and get your website created from scratch! It is a lot of hassle to build a website, we do understand that. But we also understand that it requires commitment and a lot of it! Before you venture forth on this journey, we suggest that you ask yourself the 5 questions we mentioned in the beginning of this article. If you have the answers, the article will help you in deciding what will work best for you and your business! Hopefully, you won’t have to come back to read this again!